There is a reason that the Skeptic and I don’t sit down often in the middle of the day to have a conversation. At least we don’t sit down for more than five minutes. But after a long day at work we were a bit delusional and thought we could. Math Boy and Knittykid were playing in their new fort in the back yard. Spinner was toddling around the house minding his own business. So we sat. And chatted. And had a very nice conversation, uninterrupted until the two boys came inside, Knittykid saying “happily, look what we painted!” While Math Boy hid his hands and tried to run upstairs. Their hands were purple. Their clothes were purple. And outside? They wanted to paint their fort. 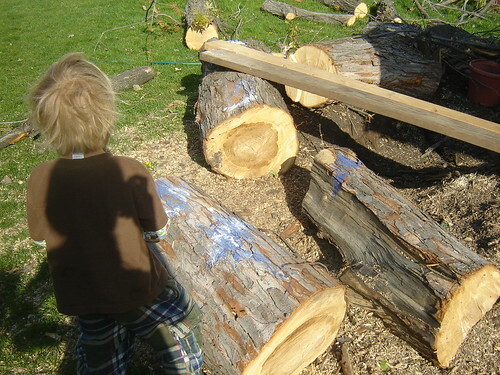 (You’re looking at the logs from our poor maple tree, lost in the tornado last summer and waiting to be cut up for either firewood or backyard play materials.) It’s not much paint; I think they stopped before going too far, realizing that this was probably not as good an idea as it sounded. What blew me away was how they got the paint out of the cans. Got a guess? Go ahead, think of a good one. If you’ve been reading this blog long enough you should know by now it was not with a paint can opener. I am thankful for their creativity. I am grateful for their innovation. I am in love with their spirit. I am blessed with an “idea guy” as the ringleader for my rowdy little trio. And that is why I don’t sit down for more than five minutes, as least not until they are all asleep. And tonight we will remember to take all the paint out of the garage. It’s been a knitterly few days. I’m lucky to live in Minneapolis. Not only do we have scads of wonderful LYS’s but we get Yarnover, the Knitter’s Guild Spring knitting extravaganza along with an amazing line up of knitters to bring and share their skills. The list was long but in the last few days I was able to hear both Cat Bordhi and Franklin Habit speak and take classes with Meg Swanson and Cookie A.
Yarnover started with a sweet and funny keynote by Cat Bordhi. 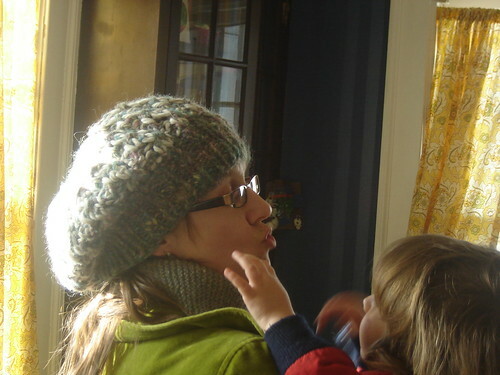 She spoke eloquently about knitting and what is was that made it so magical. After Cat’s speech it was time to take my first class of the day: two color knitting, taught by Meg Swanson and Amy Detjen. I wasn’t sure quite what to expect. Sixty knitters in one room? But I was amazed by the information she shared. Not only did I leave with a mile long list of knitting tips, but the stories she shared about her mother were priceless. 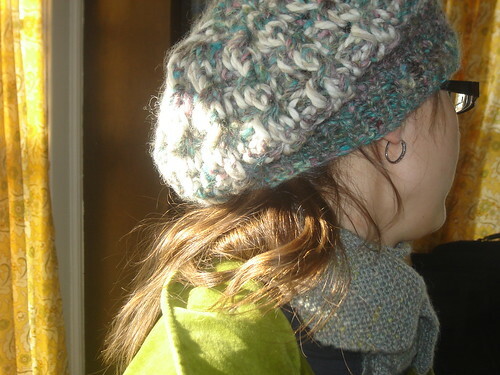 The artistry and talent were amazing, and the sweaters she brought…..gorgeous, absolutely gorgeous. I feel like I want to spend the entire year knitting nothing but Schoolhouse Patterns. Maybe time to do that intensive EZ study I’ve always wanted to do? And the best part? I can finally knit with one color in each hand as well as easily trap my stitches. 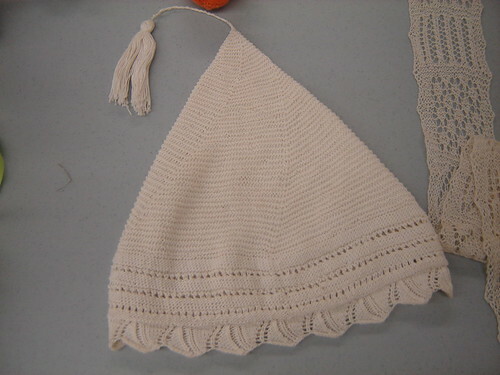 Time for some Armenian knitting, perhaps? After lunch I had a class with Cookie A on resizing stitch patterns. Unfortunately, half the class thought they were going to learn how to resize actual patterns, not stitch patterns. Poor Cookie! However, she did her best to teach everyone what they wanted to know and I did gain the skills I wanted. 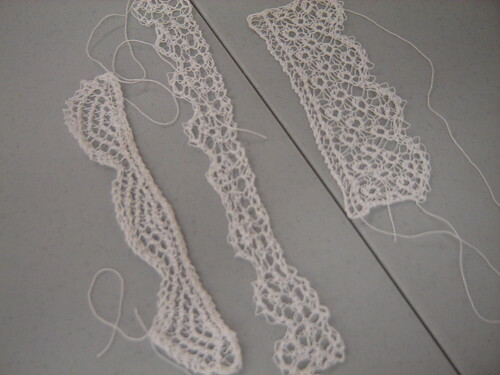 The best part was that the class broke up a little early (I think they all wanted to hit the yarn market before it closed) so I had the chance to sit down with Cookie one on one and take a look at how she would resize a complicated pattern from one of her socks. Not only did I learn how to resize but I also learned about the design process, stitch patterns and charting. Talking through it with Cookie was very helpful. 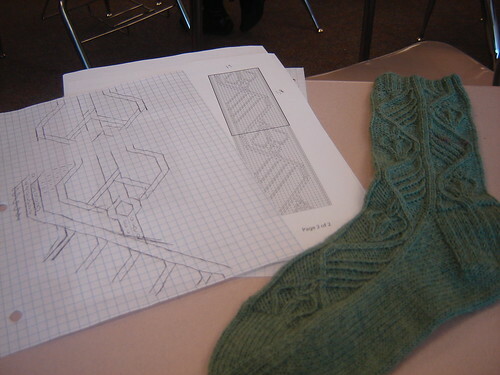 Cookie’s sock and pattern; my attempt at making it bigger. I was waaaaay off track. 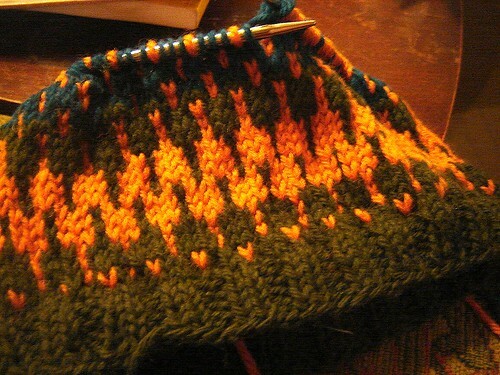 The trick is to start with the biggest lines in the pattern, not the smallest. Knowing that Shepherd’s Harvest was coming up in a few weeks, I restrained myself and bought only one thing I’ve always wanted, the Wild Apple Bohus hat kit from Fairy Hare Yarns*. It was quite a splurge ($50 for a hat? really, $50 for a hat? the Skeptic kept saying…) but I did have birthday money I had been saving for the occasion. So yes. $50 for a rare hat kit; totally worth it. 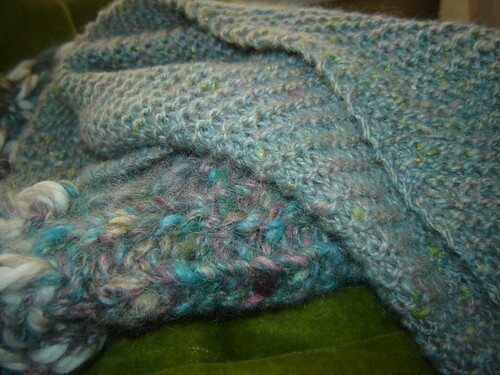 I had two days to soak in all this knitterly goodness before the grand finale of this long weekend, Franklin Habit. Franklin was the guest speaker at the Knitter’s Guild and he was fantastic. His presentation was all about historical knitting. Now, I knew he had his column on Knitty but had no idea that he’d been doing so much research into how knitting went from something passed on from one person to another to something written down in instruction form. He was funny and extremely knowledgeable about the subject, and made that old and forgotten history major in me perk right up. Considering that written patterns began with absolutely no standardization whatsoever, it’s quite amazing today that somehow we’ve managed to come up with a cohesive language for knitting at all. Not only did Franklin share the history, but he brought samples of the historical patterns he’s worked up and I had the chance to take a look. He made an excellent point about going back to these historical patterns. We’ve lost some useful things over the years. The baby hood? Padded around the edges for extra warmth and protection. And the nightcap? Why did we stop using nightcaps? I live in an old house and I freeze at night. And the orange? Well, you know how we knitters all like knitting fruit just because we can. That’s always been around. Wow, that’s some wild, escaping hair I’ve got going on there…..can you all tell I barely managed to escape the 3 boy tornado to get out of the house for this event? At least you can’t see the muddy hand print I discovered on my pants during the talk…. 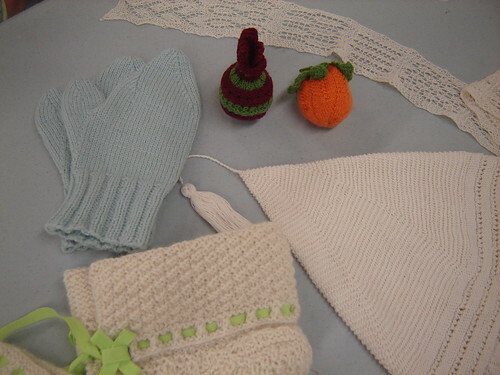 You can find the patterns for all of these items on Knitty in his column, Stitches in Time. Now, it’s 11:43. A wise woman would realize she has to be up in six hours and go to bed. 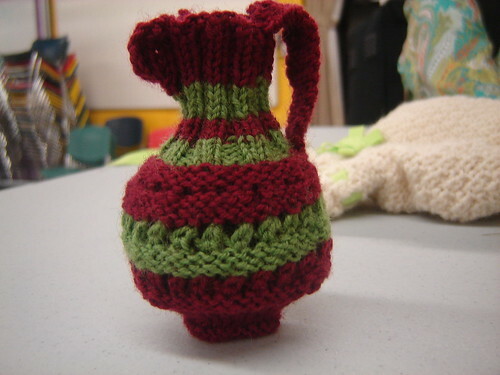 The unwise would head over to Ravelry to dig around in the Historical Knitting group. Or maybe go knit an orange. 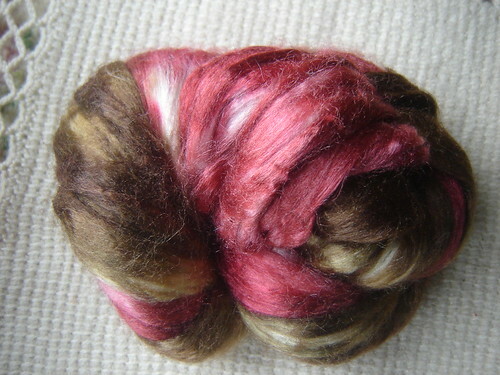 I fell in love with Shroom over on Knitty but wanted to keep with my pledge to not buy new yarn. 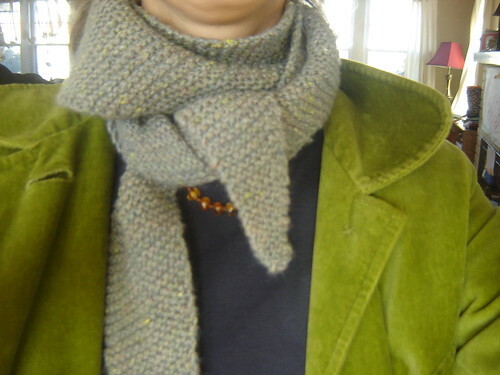 The trouble was that the pattern used a very specific yarn and recommended you stick with it. 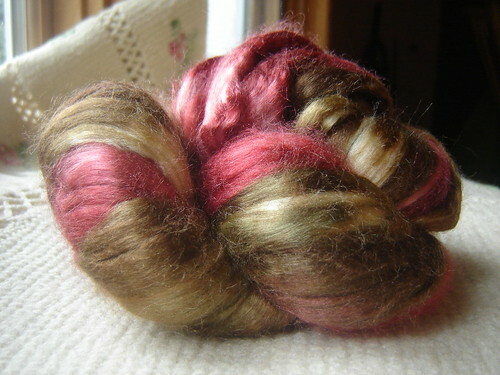 But my spinning skills were improving so I thought I could take it on. Kind of. Sadly, I’m not sold on this hat either. I love how it looks when I’m holding it. I love it at certain angles. The side is good. But from the front it’s not quite right. The drape is off and I kind of feel like I have a giant piece of popcorn on my head. Do I rip it all out? Give up on the Shroom? It might just be that this hat isn’t going to work on my head. Or maybe I do need to buy the right yarn. 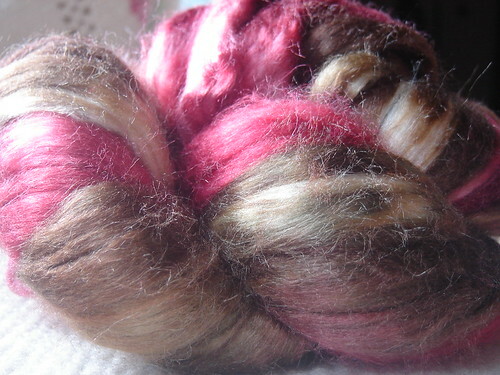 But this yarn is so pretty, I love it. 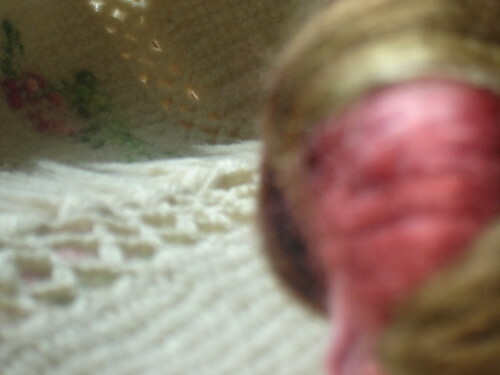 It needs to be worn, not hidden in the bottom of the woolens basket. What would you do? You’ll notice that the Baktus is also finished. I am completely, totally in love with it. 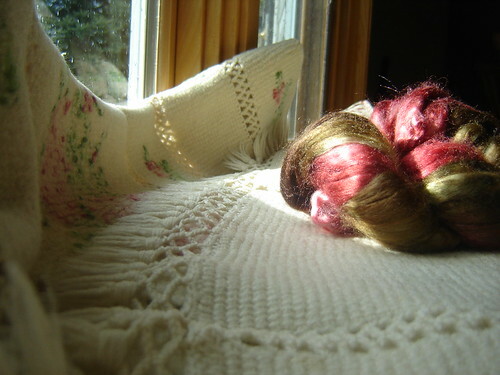 The fact that I spun the yarn, that it was perfect for this project, feels perfect, drapes beautifully. It makes up for the misguided Shroom. See how lovely it all looks together? I’m just not quite sure about it on my head…..
Keep your fingers crossed that About Hats, Part Four will able to be published. Because the hat in question is missing. 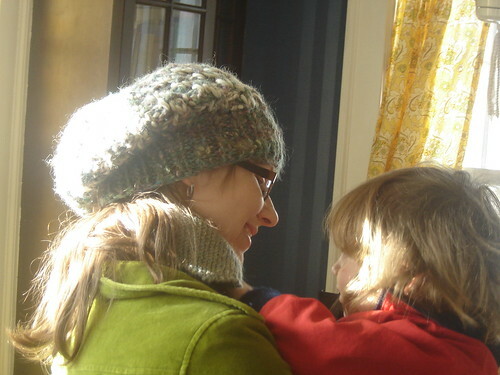 The perfect spring boys hat, complete with new pattern, is lost. 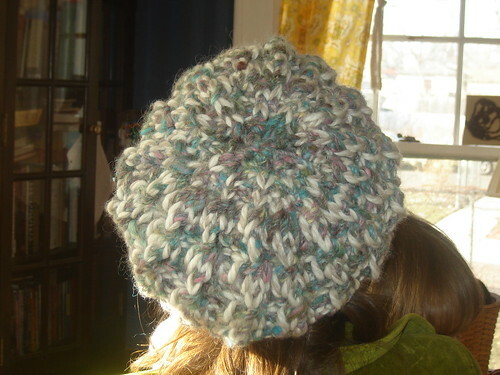 And I know it’s a hat you’ll want to knit, if only I could find it. P.S. Little Man, ahem, I mean Math Boy (he settled on that nickname) says thank you for all the birthday wishes! So kind of you to take the time! 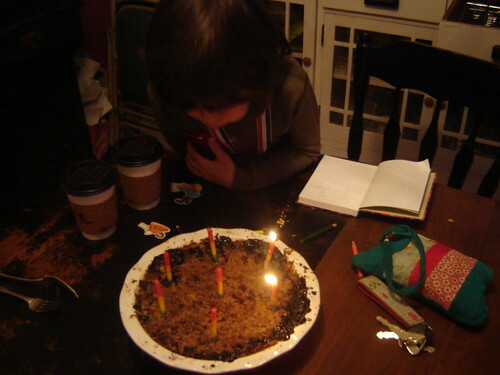 Yesterday, Little Man* turned seven. Seven. It’s amazing to me to even think about that fact that my little guy is seven years old. Happily, he still needs to crawl into my lap at least once a day for some cuddles, and he still asks me for “mama time” when he needs it. But this little boy is growing up. I can start to see the picture of who he might be emerging. As hard as it is to let he baby in him go, it’s so exciting to watch him grow and emerge into this person. So happy birthday to my little man, my boy. You bring curiosity into our lives. Questions. Ideas. You are full of excitement and energy. You are passionate and full of life. Every day you make us think, and think hard about something or other. You remind us to be sensitive, to be caring, to love. To take the time that little boys need to grow, learn and feel loved. You are patient with us, because you’re our first born and we’re learning right along with you. Happy Birthday!! !